I've been busy over the past couple of months! The next big event I had during the summer was attending Sukoshicon Pokecon in July. 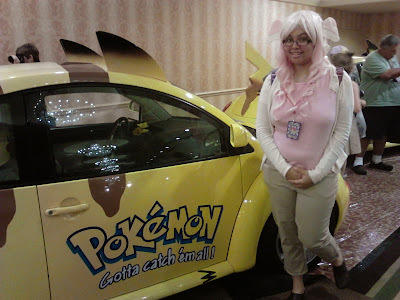 I felt almost as if I was going on an odd pilgrimage as I mostly went to the convention to see the three Pikachu Volkswagen Beetles in person. I've dreamed of owning one of these cards since I was a kid, so when I got to see one in person, it was kind of overwhelming in a great way. I had a great time at the con overall, and it was a real joy getting to listen to Eric Stuart and Stuart Zagnit speak about their feeling on the Pokemon craze all these years later.